If you visit the newly re-hung Guildhall Art Gallery, you will find a painting by John Pearce sharing space with artworks by Rossetti and Millais. While these great artists have undoubtedly rendered plants to beautiful effect, you can only stand back and admire, whereas Pearce’s plants, always the main subject, draw the viewer into the scene and into their world. Once there, if you take the time to really look (and listen), memories, sensations and understanding of interconnectedness are evoked. We have so much appreciation for an artist like John, whose work honours both the beauty and essentialness of plants. Some of his paintings and words are shown below, to see more please visit his website. I find a neglected corner of a private estate or garden: my subject is a community of wild plants growing in untamed abundance on the surface of the planet Earth and I present this centre stage, with the human world modestly in the background. Small, fenced-off, owned areas of the planet can offer a unique sense of closeness to nature and remoteness from ‘the world’. Although my representation of nature could be termed ‘realist’ – the sort of composition I favour is definitely post-cubist. There may be few parallels in poetry to T. S. Eliot’s tone of meditative soliloquy in Four Quartets, but I have found that painting can follow a comparable path in a quest for ‘the point of intersection of time and the timeless’. Beyond the darkness of the enclosing hedge, the land slopes away, and one can see through it the blue, humid glint of a valley of chalk downland – it is typical of Chiltern countryside that the valleys are enclosed spaces of chalk grassland, while the hilltops are crowned with extensive beech woods, scattered villages and common land. I completed the picture in four weeks, working eight hours a day. At the time this was the longest I’d ever spent on one painting, though now I can take four months or more. 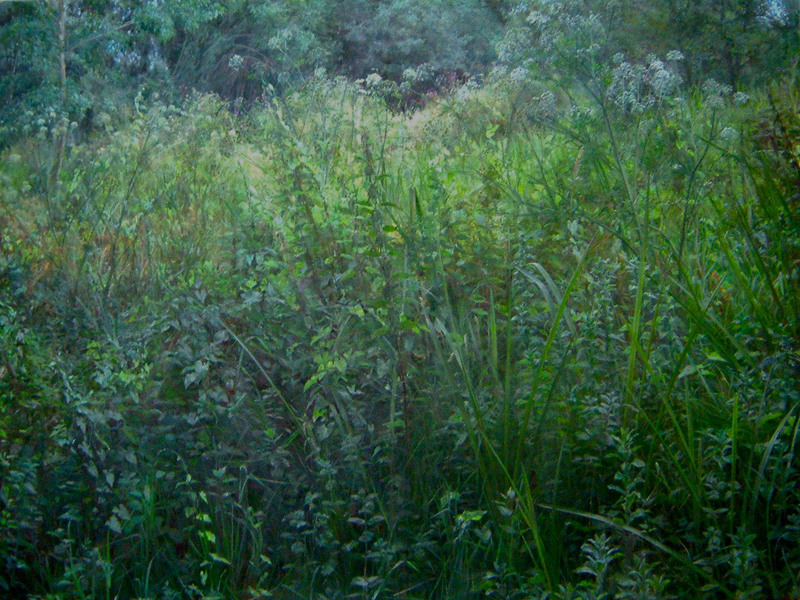 Meanwhile the brambles in the foreground grew rapidly and became the main subject of the picture..
Blackberries, biochemistry and daylight are, for me, unifying themes in the painting, but the naturally unrestricted process of drawing discovers many linked aspects, such as the spaces which emerge with vegetation and its growth, or half-hidden paths threading through the well-lit foreground to the dark background trees. Thereby an overgrown urban garden can come to speak for much more than itself. The name ‘Queen Anne’s Lace’, despite its genteel appeal, has never quite caught on. ‘Cow parsley’ means an inferior form of parsley, but association with cattle is appropriate to a flower of May, the fertile month when the sun enters the zodiac sign of Taurus, the bull.